Step up your side dish game with these Garlic Parmesan Roasted Mushrooms! Gluten-free and full of garlicky goodness! It’s that glorious time of year just before the holiday season madness is upon us. Granted, I totally welcome this madness with open arms but it’s a loooooot less chaotic if I start planning ahead way before the fact. This easy peasy mushroom dish has been on my test run list for a while now and I’m so stoked to finally have it in my face and on the blog! It’s fast and flavorful and honestly, can totally double as an appetizer if you’re bold enough to just dive on in with a toothpick! 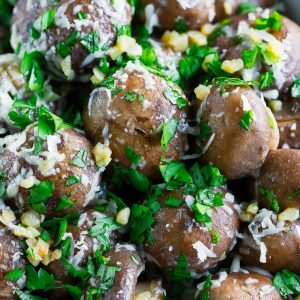 You can even the recipe if you’re serving it as a weeknight side dish for the fam, since this super speedy recipe pairs great with your favorite protein. 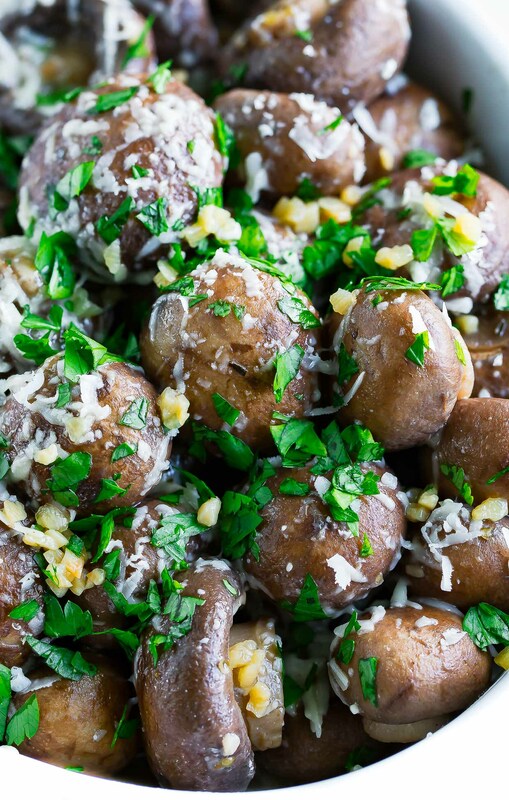 These mushrooms are a garlic lover’s dream! Featuring a classic combo of garlic, butter, and parmesan, this scrumptious side dish is a welcome addition to your holiday spread. Step up your side dish game with these Garlic Parmesan Roasted Mushrooms! Gluten-free and totally glorious. Melt butter and add your smashed/minced garlic. Set aside. Trim the stems and clean mushrooms by wiping with a slightly damp paper towel. (Washing in water can cause them to soak up water and become soggy) I kept my mushrooms whole here but *totally* feel free to halve or quarter them if you prefer! If I have a few spare seconds I'll cut mine in half. Line mushrooms in even layer atop a rimmed baking sheet and drizzle with garlic butter, tossing to coat. Roast for 20 minutes or until tender and golden. Add any additional seasoning you'd like and sprinkle with parmesan cheese. Dive in while they're hot! Salt tends to be a very personal matter with recipes so I'm going to let you feel this one out based on preference. I used unsalted butter and added around 1/4 tsp sea salt to my mushrooms. There's also a saltiness to the parmesan cheese so keep that in mind while seasoning and you're good to go! 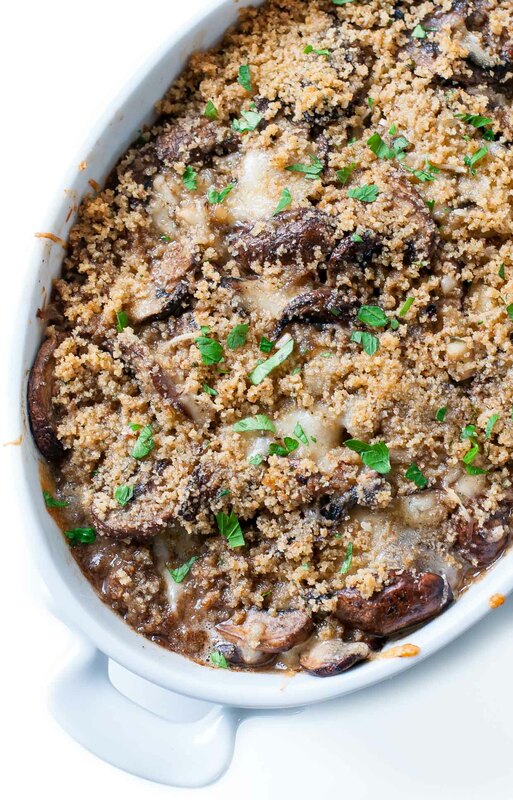 This recipe easily serves a crowd at about 8-10 servings but I’m not going to sit here and pretend that my husband and I didn’t eat the entire 2 pounds of mushrooms in a single sitting. I regret nothing, I tell you! Nothing! Totally mad for mushrooms? Try my (un) Stuffed Mushroom Casserole next! looking for a few more side dishes? we make these often! Slow Cooker Apple Cranberry Sauce – always a hit for the holidays! Classic Stuffed Mushrooms – my mom’s super tasty recipe! If you get a chance to try these Garlic Parmesan Roasted Mushrooms, let me know! Leave some love in the comment form below or tag your photos with @peasandcrayons on Instagram so I can happy dance over your creation! These look amazing! Can they be prepared a day before and then reheated? Thanks Darlene – we love them! I haven’t tried reheating simply because the roast time would be the same as the reheat time unless you were microwaving them? The 20 min roast time is super quick but I’m sure they could be made and microwaved if preferred; the texture will just be a bit different. This has to be the ultimate mushroom recipe! All of the garlic and parmesan looks awesome! 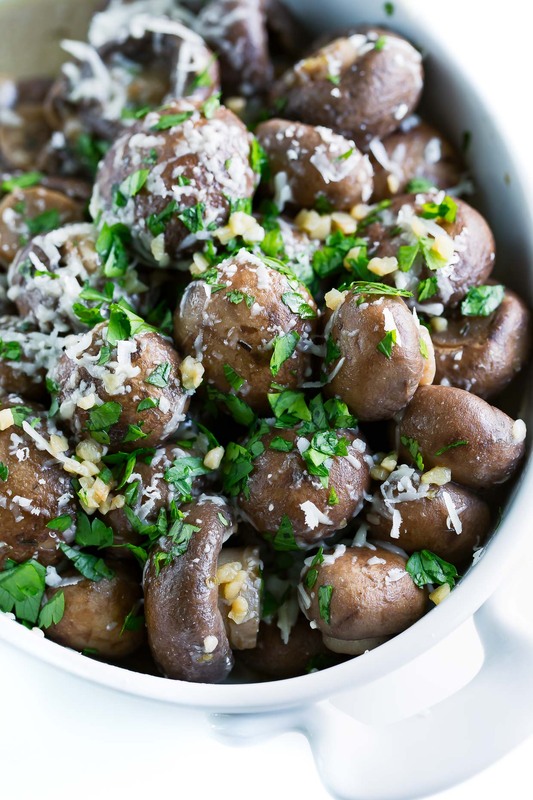 Oooh, these mushrooms look delicious, especially with the garlic and parmesan! Perfect as an appetizer too, but I think I try these with grilled steak! OMG this sounds so delicious. Mushrooms and cheese = true love. Yummy!! My kids would love this recipe! I like how it would make a great pot luck recipe with the holiday coming up ?.